2nd Bn, The Coldstream Guards, 1st (Guards) Brigade, Guards Division, B.E.F. Eustace George St Clair Chance, Coldstream Guards was killed in action in the 27/9/18. He was third and youngest son of Mr and Mrs George Fergusson Chance of Linden near Malvern (the former High Sherriff of Worcestershire). He was born on March 11 1899 and was educated at Summerfields, St Leonards and Eton and had passed the Cambridge entrance exams, and was planning to go to Trinity College in October 1918. However on leaving Eton in the summer half of 1917 he joined the Guards Cadet Battalion at Bushey. In December 1917 he received his commission in the Coldstream Guards. After training in Windsor, he joined his battalion in France in May 1918 and except a one week course served continuously until his death. His brothers Roger and Hugh both served in the Armed Forces. 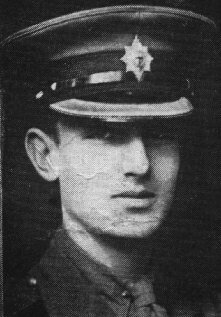 The eldest, Second Lieutenant Roger JF Chance was in the 4th Dragoon Guards and was recommended for a French gallantry decoration in 1914. The 4th Dragoon Guards and 9th Lancers charged against the enemy’s unbroken lies of infantry. He was struck during the charge, but his collar badge saved him from injury. He was later wounded by shrapnel in November 1914. He survived the war. Hugh Chance initially volunteered for service with the local territorials, but bored of defence duties on the East Coast with the 2/8th Worcesters, he volunteered for the Royal Flying Corps and was taken prisoner towards the end of the war; he also survived.